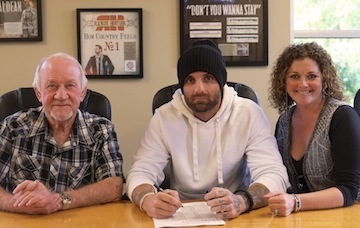 Magic Mustang Music has re-signed writer Westin Davis to a publishing deal. Davis, a Fernandina, Fla. native, penned “Young Love,” the upcoming new single from Kip Moore’s sophomore record, as well as cuts for Thompson Square and Tracy Lawrence. “Westin is an incredible songwriter and one of the hardest workers I know. His success is well deserved. I am elated to have him here at Magic Mustang.” said Juli-Newton Griffith, Sr. Creative Director at Magic Mustang Music. Magic Mustang Music is home to songwriters Jason Aldean, Thompson Square, Steve Bogard, Sherrie Austin, Lindsay Ell, David Fanning, Rob Hatch, Kristy Lee Cook, Kurt Allison, Tully Kennedy, John Edwards, Rich Redmond, Erik Habig, Justin Lantz, Jason Delkou and Justin Wilson.